Okay, so this is very subjective, but if you're looking for a great kids' movie this school holidays, don't go past THE LORAX. This Doctor Seuss inspired film has it all - a captivating story with an environmental, anti-corporate greed message, goodies and baddies, cute animals, good music and damn awesome graphics. Parents will be glad to know there's a minimum of violence - okay, a few teddy bears get hurt, but don't seem to suffer. It's accessible for a wide range of ages from toddlers to young teens. All but the hardest, hairiest adults will enjoy the film. The film, based on a Doctor Seuss' children book of the same name, published in 1971, stars the voices of Danny DeVito, Zac Efron, Taylor Swift, Rob Riggle, Ed Holms and Betty White as the main characters. The plot surrounds a young boy's (Ted's) search for a truffula tree to win the affection of Audrey, the girl he loves. In the world of the Thneedville everything is synthetic and trees are a relic of the past. On the advice of his grandmother, Ted approaches the Once-ler, a strange scary character who lives outside the confines of Thneedville in a grim and polluted, apocalyptic type setting. 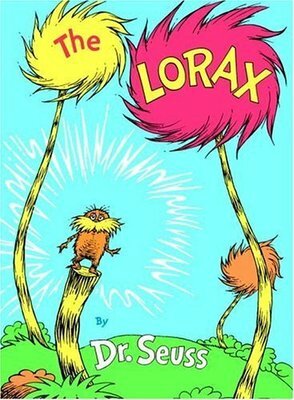 Through the Once-ler, Ted learns the truth about the destruction of the trees for the sake of corporate greed. The stark contrast between the ravaged landscape and the stunningly beautiful world of the past, produces an emotional reaction in the viewer, and moves all but the hardest hearts. Even my three year old was crying out - "I have to help it," as the final remaining Truffula tree, standing alone in a sea of waste, was bulldozed down. Okay, I need to straighten out a few things. Truffula trees are not trees in the sense we know it – but thin reed shaped towers with fluffy tops in bright pinks and purples. Hey, this is Doctor Seuss and the reason we love him is the imagination and bright colours he brings to our world. This fun world includes the key character of the Lorax, a fabulous fluffy orange being and Guardian of the Trees, who floats magically down from the sky. At the end of the show, my three year old was still glued to the screen watching the credits and jiggling in time to the final catchy tunes. This was followed by a request to see it again. Length was perfect and there were no boring moments in the film. Throw in a popcorn and you've worked magic – kaboom. Cynics should steer clear though. The Lorax can be seen in a range of cinemas including Village and the Dendy. There is a 3D version. For a free trailer check out the official Lorax movie site.